Robert Roy MacGregor, (March 7, 1671 - December 28, 1734) usually known simply as Rob Roy or alternately Red MacGregor, was a famous Scottish folk hero and outlaw of the early 18th century, who is sometimes known as the Scottish Robin Hood. 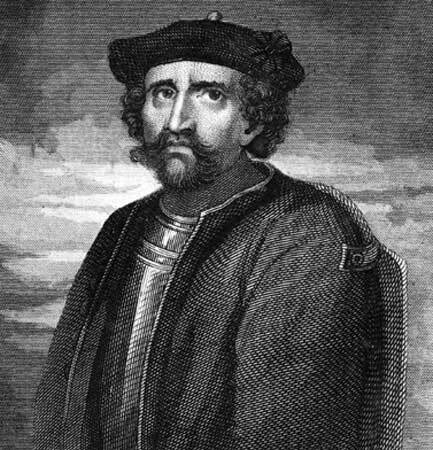 Rob Roy is anglicised from the Gaelic 'Raibeart Ruadh', or Red Robert; this is because Rob Roy had red hair, though it darkened to auburn in later life. Rob Roy was born at Glengyle, at the head of Loch Katrine, as proved by an extract from the Register of Baptisms at Buchanan Parish. His father was Donald MacGregor, and his mother Margaret Campbell. He later met Mary Helen MacGregor of Comar, who was born at Leny Farm, Strathyre, and they were married in Glenarklet in January 1693. They had four sons: James (known as Mor or Tall), Ranald, Coll, and Robert (known as Robin Oig or Young Rob). A cousin, Duncan, was later adopted. Along with many Highland clans, at the age of eighteen Rob Roy went to battle with his father to support the Stewart King James against his challenger, William of Orange. Although victorious in initial battles, the clans’ leader was killed and their fortunes fell. Rob’s father was taken to jail, where he was held on doubtful treason charges for two years. Rob’s mother Margaret’s health faltered and then failed during Donald’s time in prison. By the time Donald was finally released, his wife was dead, and his reason for living also gone. The Gregor chief would never return to his former spirit or health. Rob Roy became a well-known and respected cattleman — this was a time when cattle were considered common property, taking someones cattle was not illegal, and selling protection against theft was an honest means of earning a living. Rob Roy borrowed a large sum of money to increase his own cattle herd, but due to the deception of his chief herder, who was entrusted with the money to bring the cattle back, Rob Roy lost his money and cattle, and defaulted on his loan. As a result, he was branded an outlaw, and his wife and family were evicted from their house at Inversnaid, which was then burned down. After his principal creditor, James Graham, 1st Duke of Montrose seized his lands, Rob Roy warred with the duke until 1722, when Rob Roy was forced to surrender. Later imprisoned, he was finally pardoned in 1727. He died in his house at Inverlochlarig Beg, Balquhidder, on 28 December 1734. Daniel Defoe wrote a fictionalized account of his life in 1723 called Highland Rogue, making Rob Roy a legend in his own lifetime, and influencing George I to issue a pardon for his crimes just as he was about to be transported to the colonies. The publication of Rob Roy, by Sir Walter Scott in 1817, further added to his fame and fleshed out his biography. 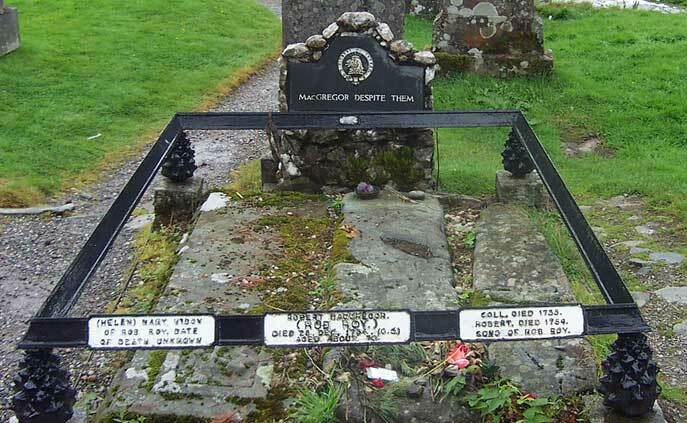 William Wordsworth wrote a poem called "Rob Roy's Grave", during a visit to Scotland (the 1803 tour was documented by his sister Dorothy in Recollections of a Tour Made in Scotland). Adaptations of his story have also been told in film, most notably Rob Roy (1995), directed by Michael Caton-Jones. Glengyle House, on the shore of Loch Katrine, dates back to the early 18th century, with a porch dated to 1707, and is built on the site of the 17th century stone cottage in which Rob Roy is said to have been born. Since the 1930s, the Category B-listed building had been in the hands of successive water authorities, but was identified as surplus to requirements and put up for auction in November 2004, despite objections from the Scottish National Party. Where was Rob Roy born? At Glengyle, at the head of Loch Katrine. On 7th March 1671, as proved by an extract from the Register of Baptisms of Buchanan Parish. His father was Donald MacGregor, his mother Margaret Campbell. Was he a MacGregor Chief? No, he was the third son of Donald of Glengyle, a chieftain. But later Rob Roy became War Leader of the clan, which entitled him to wear the three eagle's feathers of a chief. Mary Helen MacGregor of Comar, born at Leny Farm, Strathyre. They were married in Glenarklet in January 1693, according to Buchanan Records. How many children did they have? There is recorded proof of four sons only. They were James, known as Mor, or Tall; Ranald; Coll; Robert, known as Robin Oig, or Young Rob. A cousin Duncan was adopted. Why did he get the name Rob Roy? It was anglicised from the Gaelic Raibert Ruadh, or Red Robert because he had red hair, which darkened to auburn in later life. Was Rob Roy ever imprisoned, or captured? There are many legends of imprisonment but no proof. He was captured several times but always daringly escaped. In his house at Inverlochlarig Beg, Balquhidder, on 28th December 1734, report in the Caledonian Mercury newspaper one week later in Edinburgh. What property did he have? In his will, given by his wife to the Commissary at Dunblane, he left £274:13:4 Scots, equal to £23 English, all to her. In Balquhidder Kirkyard, confirmed by information given by his descendants to the Clan Gregor Society. The detail on the ornamental bronze rail round his grave gives his age wrongly as 70. He was 63. Has he any living descendants? James had 14 children recorded; Coll had a son and daughter recorded; Ranald married his cousin Jean, daughter of MacGregor of Glengyle and the Glengyle line descended from them; Robin Oig's wife died young and there are no records of legitimate descendants from him. But many persons alive now claim descent from Rob Roy. 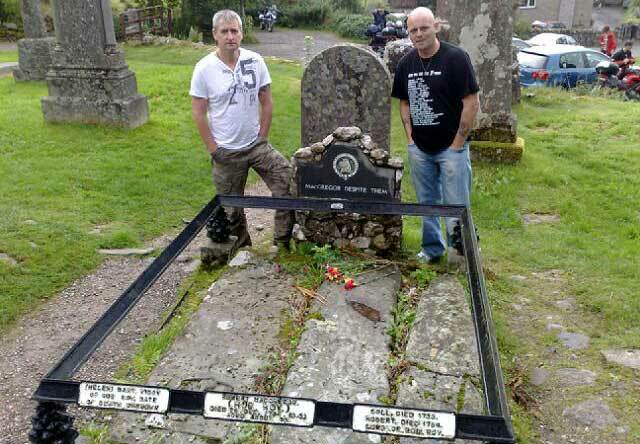 Davy and Aldo at the graveside.